Beautiful handmade Birthday Card in a sumptuous colour palette of Chocolate, pink, mint & white. large square 6" x 6" top quality scalloped edged card blank in white with matching envelope. Butterfly is mounted onto textured and punched cards of mint and white, which also sit upon a patterned designer paper by K & Co with a floral design in choclate, pink, mint & white. This has been matted & layered onto textured mint card to colour co-ordinate. 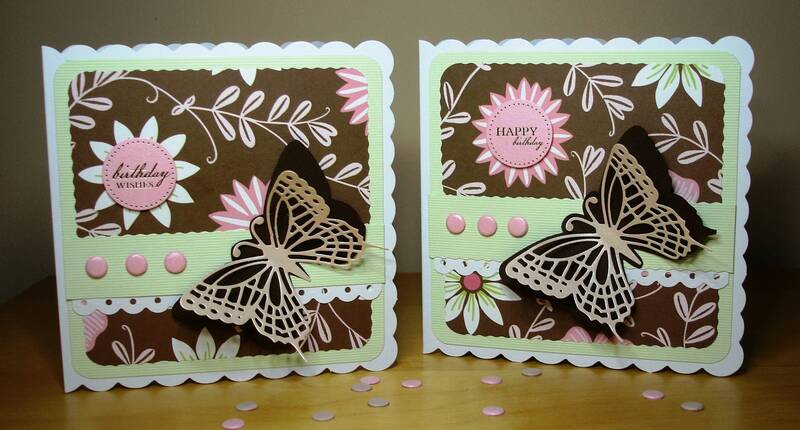 A Sentiment of either ' Happy Birthday' or 'Birthday Wishes' has been 3D attached to the centre of a flower on each card. Folksy :: Buy "Pink Feminine Birthday Card"
Folksy :: Buy "Retro Dog shaped card, suitable birthday or other occasions Handmade"